Easy Pickings is a 1-vs.-3 player minigame in Mario Party 7. Its name is a pun on pick-axe and a term that refers to easily procured resources, often at the expense of others who are then called "easy pickings" themselves. The opening cinema of the game shows the players riding on a miner's cart to the area where the game takes place. When they arrive there, they all break the rocks in their path. The goal of the game is to find the most gems by smashing rocks. Red gems are worth one point, and purple gems are worth three points. The dark rocks in the game cannot be broken. Both the solo player and team of three must do this to win. 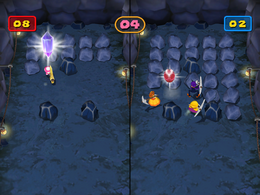 However, the solo player uses a giant pick-axe, which breaks rocks with a single hit. Each member of the team of three uses a small pick-axe, which breaks rocks with three hits. The player or team that collects the most gems within thirty seconds wins. However, if the solo player and the team of three get the same amount of gems by the end, the game is a draw. Rules – "Smash the rock to find gems! One player has a big pickax while the other 3 have smaller ones." Advice – "The big pickax can smash a rock in 1 swing, but the small ones take 3 swings. You can't break certain rocks." This page was last edited on August 4, 2017, at 19:53.